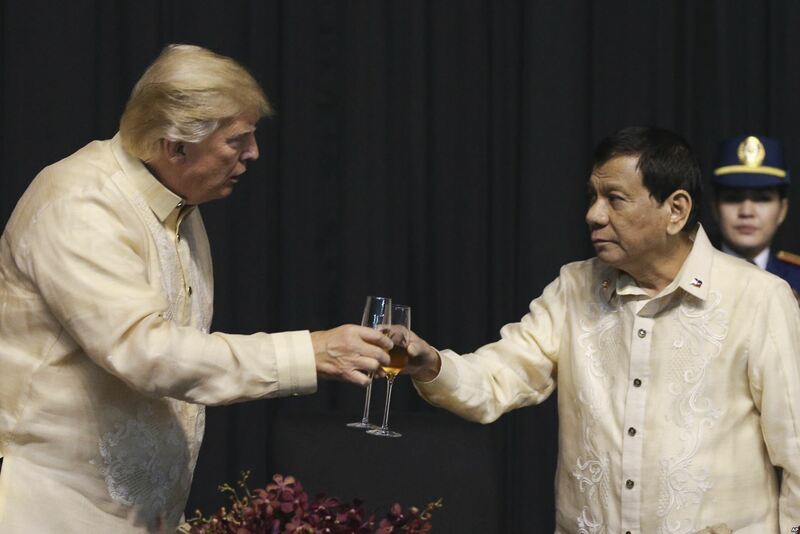 U.S. President Donald Trump toasts with Philippines President Rodrigo Duterte during the gala dinner marking ASEAN's 50th anniversary in Manila, Nov. 12, 2017. In the Philippines, nearly a year after President Trump first sketched his Free and Open Indo-Pacific policy at the 2017 APEC CEO Summit, uncertainty about how the United States will operationalize its vision lingers. Beijing’s vaunted infusion of capital, and influence across all dimensions of Philippine society, including through its multi-billion dollar investments into key Build, Build, Build infrastructure projects, has amplified this uncertainty. Indeed, the common refrain in Manila is that while the United States remains a good friend, China will always be the Philippines’ watchful, at times menacing, northern neighbor. As the United States operationalizes its Indo-Pacific policy, it will need to ever more conscientiously strike a balance between providing assurances of the durability of US commitment to the region and encouraging Philippine autonomy, particularly amidst Chinese incursions. 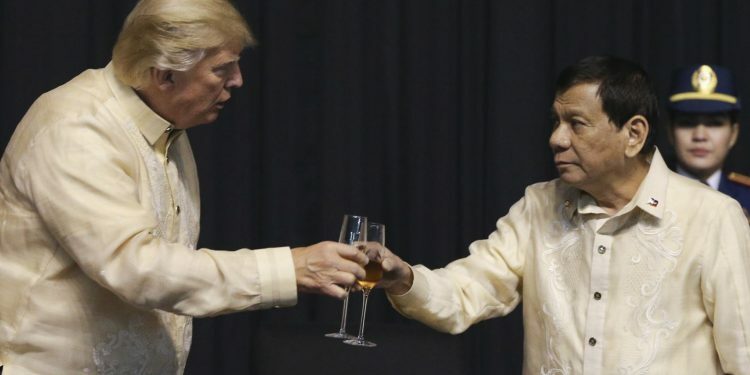 The United States will also need to grapple with how best to promote its positive agenda for a rules-based order in a way that not only safeguards its own interests but also directly appeals to the aspiring middle classes of the Philippines and beyond. The Indo-Pacific framework, at its core, underscores the shift in the global economic center of gravity and other dramatic changes that are afoot both in the Philippines and across Southeast Asia. Yet, despite the sharp contrast between today’s mercurial leaders and their predecessors, the elements of continuity in policy dwarf elements of change both in the United States and the Philippines. Across the diplomatic, economic, and security domains, the American commitment to the rule of law, freedom of navigation, sustainable economic development, and good governance both in the Philippines and the region writ large remains stronger than ever before. Diplomatically, the United States’ Indo-Pacific policy in Southeast Asia is predicated on ASEAN centrality, as the Deputy Secretary of State recently highlighted at the ASEAN Ministerial meeting. At the same time, while ASEAN is most powerful when it speaks with a unified voice, there is also growing utility in minilateralism and more nimble, ad hoc cooperation below the ASEAN level. The Philippines’ trilateral air and maritime patrols with Indonesia and Malaysia in the Sulu and Celebes Seas offer a case in point. Moving forward, the United States should not only support ASEAN cohesion but also smaller, effective coalitions of the willing to showcase American and regional commitment to a rules-based order. Within the realm of security engagement, the Indo-Pacific policy puts down a marker for the peaceful resolution of disputes and as a potential hedge against major power assertiveness. That assertiveness has been on display most prominently in the South China Sea, where Beijing has coupled unsurpassed militarization of artificial land features in the Spratly Islands with sharp condemnations of nations exercising freedom of navigation. While Chinese Foreign Minister Wang Yi once predicted that the idea of an Indo-Pacific Region would “dissipate like ocean foam,” the opposite is likely to be true. Building naval, air, and coast guard and law enforcement capabilities of littoral nations around the Indian Ocean, South China Sea, and Southwest Pacific lies at the heart of the United States’ security commitment to the region. The foundations for this approach were laid down by the Obama administration’s effort to fashion a principled, inclusive network. But the Trump administration is seeking to go further. This entails pursuing more group sails and closer joint training and exercises, as exemplified by the increase in the number of joint events that General Galvez and Admiral Davidson have proposed for 2019. Critically, the United States must cast its objectives, not in the divisive terms of geopolitical competition, but rather, as a bulwark against the more elemental challenges that stem terrorism, political violence, illegal trafficking, natural disasters, and other humanitarian crises. Finally, on the economic front, unleashing US private sector investment is a key part of the equation for sustainable — rather than predatory — economic development, but this requires stronger institutional frameworks. Now that talks are underway for the US-Philippine Trade and Investment Framework Agreement, the United States must work expeditiously at forging a bilateral FTA as soon as possible. To withstand future political debates, a US-Philippine Free Trade Agreement must add substantial economic and strategic value. A sustainable FTA must help the 25 percent of Filipinos who live in poverty and the 10 percent in danger of sliding back into it by stimulating business and job creation. A bilateral FTA should also raise labor and environmental standards. The United States should also proactively identify overlapping interests among like-minded countries — across the Indo-Pacific, Europe, and beyond — to harness targeted investments in key energy, communications, and other infrastructure projects within the framework of the Master Plan on ASEAN Connectivity 2025. Dr. Patrick M. Cronin is Senior Director of and Kristine Lee is Research Associate with the Asia-Pacific Security Program at the Center for a New American Security (CNAS) in Washington, D.C.